When you decide to build or renovate your home, designing the kitchen is one of the most important projects. When you consider that the average kitchen can last up to 20 years, you know it makes perfect sense to ensure that you create the best space the first time round. Taking your time in this room will help to ensure that you get the best design, configuration and room specification. Home designers agree that the popularity of open plan living has had a huge impact on every part of the home, especially the kitchen. Modern kitchens occupy a place of honor in the contemporary home. The move towards creating the ultimate kitchen has been driven by different factors ranging from a change in lifestyles to enhancing convenience. More working individuals are looking for a way to congregate in an extended room, where they can enjoy the company of the family while working in the kitchen. When choosing your kitchen design, think about your priorities and what you need for function and comfort. Following are some tips that will help you to design the ultimate kitchen. Many kitchen designers recommend designing a space that will help to enhance the life of the user. This means looking for a design that will optimize workflow while reducing traffic and maximizing storage space. A good kitchen design and configuration will ensure that you reduce stress by placing items that you use frequently within easy reach. Less frequently used items can be stored above or below the easy to reach drawers. Full extension drawers and other modern designs can help to maximize the storage space. Grouping the kitchen by activities can help to enhance efficiency from a usability perspective. 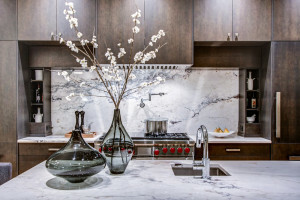 When planning your kitchen renovation in Calgary, you need to come up with a checklist. Approaching the designing process in a logical and methodical manner will help you to bring your concept to reality. There are several practical aspects to consider but at the end of the day, your budget will determine the choices you make. Your budget will determine the materials, appliances and finishes that you choose and you should also ensure that you set some money aside for contingencies. Do some research and find out where you can find the best quality products at the best price. When choosing the design, think about your current as well as your future needs. This is the best way to ensure that you do not have to renovate again within a few years. Factors such as the current and future size of your family should be at the forefront of your mind when planning to renovate the space. You should also think about your cooking habits, lifestyle, shopping habits and how you intend to use the kitchen. If your family loves to spend time in the kitchen, an eating or seating area should be part of your design. If you love plenty of help while cooking, think about the amount of work space you need. One of the most important decisions you have to make when planning the kitchen design is the type of cabinetry to install. Kitchen cabinets are often the most significant part of the design and this is reflected in the fact that they take up a substantial part of the budget. Kitchen cabinetry comes in a wide range of finishes and guises that affect the price significantly. Choose an option that is right for your budget and circumstances. Think about the overall look that you want to achieve when choosing the cabinets and remember that adequate storage space is essential. It is important to plan your kitchen design with different functional zones in mind. Think about specific areas for cooking, preparation, cleaning and storage of consumables and kitchenware. The position of the sink is vital when you consider that a substantial amount of time is spent in this area. Think about ergonomics in the design and remember that small practical steps will reduce stress. The best plan will help to ensure you avoid shelves in the base cabinets while maximizing ease of access and functionality. The floor design that you choose will determine how functional the space will be. Plan to have adequate work space on the counter top while improving general access in the entire kitchen area. Ensure that you have enough room for at least two people to work in the kitchen space and to make sure that appliances and cabinetry open easily. Apart from ensuring that you have adequate space, you also need to choose the best materials for the surface. A professional kitchen designer will help you to make the best choices. For the ultimate kitchen design, you cannot overlook the appliances. Apart from the best design, think about energy and water efficiency. All in all, it is very important to ensure that you use professionals to ensure that you end up with the best kitchen design.